IRVINE, CA / ACCESSWIRE / April 20, 2019 / Are you a student looking to find the best repayment plan for federal loans? Education is becoming increasingly costly. In addition, the challenging financial times have served to make the situation even more difficult for new graduates to meet their student loan repayment. Fortunately, SL Account Management is committed to providing help to borrowers of federal student loans, especially in setting up a repayment option that is affordable. We are pleased to help you handle all the issues around preparation of federal student loan documents and negotiating repayment relief programs. We are not government agents neither are we loan providers. Instead, our core business is facilitating the repayment plans for borrowers. History is replete with crucial cases involving loan providers being accused of subjecting loanees to a complicated repayment program than it should be and because of hindering the students from accessing and paying down their loans. With SL Account Management, you are assured of the assistance you need. We always ensure that every paperwork is done accurately and in a timely manner to allow for early action. SL Account Management is dedicated to working for the borrower and that it is not an affiliation of any other agent of the government, and as such, we only receive the payment for the services once the repayment program starts to run. We have assisted thousands of borrowers find the best repayment plans. We understand that every student has unique needs, so we customize a plan to suit your needs. Our experts understand that the repayment amounts will vary considerably across the board depending on income levels and lifestyle. We carefully use these factors to carefully design a loan repayment program that is sustainable. In fact, sustainability of a repayment plan is our key priority issue since we want to ensure that our clients easily follow through with an affordable repayment amount. We do that through a thorough analysis of the financial situation of our individual clients to ensure that the final plan is consistent with the client’s ability and lifestyle. Statistics about student debt in America is worrisome and analysts suggest that the situation could worsen in the near future. Today, the average student loan debt is approximately $37,000. This is a clear indicator that many students are becoming overburdened by loan debt than ever before. Finishing school only to find that you are already in debt is not only stressful but also a crippling experience. Navigating the murky waters of being in debt can be a tricky affair, which is why you a workable repayment is an overwhelming challenge for many students. This is where you need to contact a financial analyst from SL Account Management. With our professionals working for you, you are assured of finding a repayment plan that is truly sustainable and customized to suit your specific financial situation. Our experts are extremely experienced and knowledgeable in filing all the necessary paperwork. We will walk you through the entire process of document preparation. Our highly reputed account representative. We will not only prepare the documents but also educate you on all the benefits that will accrue to you when you sign up for the right plan. The documentation process can be a little challenging for an average person, but our experts will help simplify the process for you. Our key account experts understand how to go about these forms and update you on any new developments. We will generate a tailor-made loan report that simplifies your financial situation by breaking down the key components such as income, liabilities, assets and an accurate analysis of your monthly expenses based on the supplied information. Posted: April 20th, 2019 under ACCESSWIRE. OCEAN, NJ / ACCESSWIRE / April 20, 2019 / Liberty Auto Protection is one of the nation’s leading providers of extended service plans for vehicle owners. As most vehicle owners have experienced the stress of unexpected and costly vehicle repairs, companies like Liberty Auto Protection have made a business out of providing clients with the comfort of knowing their vehicles and pocketbooks are protected. Whether it is a basic or comprehensive coverage plan you are looking for, Liberty Automotive Protection has a variety of plans designed to meet the needs of a variety of clients. While there is no shortage of extended service plan providers to choose from, there is a wide variance in plans and service. Liberty Automotive Protection has helped set the industry standard by providing their clients with a wide variety of service plans for affordable prices and delivered with premium-quality customer service. While the coverage plans vary on what services and parts are covered, all Liberty Auto protection plans include car rentals, roadside assistance, trip-interruption protection, transferable coverage, national coverage, and an unlimited amount of claims. Liberty Automotive Protection can provide you with a free quote by filling out user-friendly form on their website. Your local Liberty Auto Protection address can also be found on the website if you prefer to do your research in person. You can choose between the Select, Engine, Powertrain, and Powertrain Enhanced coverage plans. The Select coverage plan is recommended for those wanting a comprehensive full-coverage policy that protects a vehicle’s most important components. Recommended for newer vehicles, the Select coverage plan includes the engine, turbo charger, transmission, drive axles, transaxle, electrical, steering, suspension, brakes, air conditioning, electronics, sliding doors, GPS, and more. The Engine coverage plan is ideal for older vehicles as it protects against costly engine repairs that are most common in higher-mileage vehicles. This plan is ideal for vehicle owners that want the peace of mind of knowing their vehicle’s engine is protected for a minimal expense, and all internally-lubricated engine parts are included. The Powertrain coverage plan protects some of the vehicle’s components that sustain the most wear and tear throughout its lifespan, that happen to be some of the most costly to repair. This coverage plan is ideal for newer vehicles that are still under the manufacturer’s warranty and whose owner plans to continue driving the vehicle after the expiration of the warranty. This coverage plan includes the internally-lubricated engine parts, drive axles, and the transmission. The Enhanced Powertrain coverage plan includes the vehicle’s engine, drive axles, and transmission. In addition to including everything the powertrain coverage plan does, the Enhanced Powertrain coverage also covers the electrical and air conditioning. When it comes time to invest in an extended service plan, putting a call into the Liberty Auto Protection phone number can help get you on the road to peace of mind and vehicle protection. Vehicle owners know how stressful and expensive vehicle repairs can be. Extended service plans help protect against the most common repairs that vehicle owners are most likely to face based on their driving habits, vehicle types, and budgetary needs. Through premium-quality customer service, basic to comprehensive coverage plans, and affordable rates, Liberty Auto Protection has built up a solid reputation and has become an industry leader. From the Select, Engine, Powertrain, and Powertrain Enhanced coverage plans, clients are provided with extended service plans that come with the additional benefits of unlimited claims, roadside assistance, car rentals, transferable coverage, and nationwide coverage. Having a Liberty Auto Protection plan on your side can greatly ease the stress-related side of vehicle ownership. SACRAMENTO, CA / ACCESSWIRE / April 19, 2019 / California has had a historical pull on establishing success through business growth and expansion in the state. Its key position in terms of national economy has continued to attract both well-established and new organizations to the west coast leader who are looking to tap into commercial success opportunities. It is the location where many of the top businesses we think about today were born out of. Tech giants like Apple, Google, Facebook, and HP as well as organizations who have turned to California after business operations get going. An extensive list of widely known names such as Disney, Oracle, Intel, Chevron, Cisco Systems and the like have moved central headquarters to the top city locations in the state. Hiles who has established a thriving property development firm in one of California’s main competition, Texas. Being too centralized is another factor the state is facing, diversity is a big focus in today’s organizations who want to ensure they are tapping into new talent, resources and commercial networks that aren’t already operating in a crowded space. There is also another category causing businesses to think twice about placing their investment projects in the state of California – regulatory requirements. Known for its strict guidelines and regulations across areas of development, consumer products and environmental restraints; the state has made it harder in some areas to sustain growth depending on the industry companies are operating in. Development rates reflect this by showing low levels of spend on economic development when compared to other areas like Texas who has made expansion a key strategy across the state. Because of this fact, California is losing out on the competitive advantage it once owned over other locations that now have not only affordability in their corner but also a means to successfully foster developmental growth at a fast pace. Whether or not perception or fact, businesses have picked up on the sense that California as a whole is an area that takes a significant amount of time and resources to get established in. ”Despite offering some of the best in industry opportunities, access to talent and commercial infrastructure in its existing businesses, entrepreneurs are moving away from California to other states because it takes too much money and time to locate business operations there.” shares Marcus Hiles, predominant Texas based property developer who has experienced the influx of both businesses and residents transplanting from California. Though the economic model California is emulating is one of conscious development, which many argue is a positive change from the usual rapid, unregulated expansion we have come to accept in other locations; until other states follow the same guidelines it is no question the state’s economy will experience negative impacts. To learn more about business and development news visit marcushiles-news.com. Posted: April 19th, 2019 under ACCESSWIRE. NEW YORK, NY / ACCESSWIRE / April 19, 2019 / Levi & Korsinsky, LLP announces that class action lawsuits have commenced on behalf of shareholders of the following publicly-traded companies. Shareholders interested in serving as lead plaintiff have until the deadlines listed to petition the court and further details about the cases can be found at the links provided. Allegations: NIO Inc. made materially false and/or misleading statements and/or failed to disclose that: (1) NIO would not be building its own manufacturing plant and would instead continue to rely on JAC Auto to manufacture its vehicles; (2) reductions in government subsidies for electric cars would materially impact NIO’s sales; and (3) as a result, Defendants’ statements about NIO’s business, operations, and prospects were materially false and misleading at all relevant times. Allegations: Mobile TeleSystems PJSC made materially false and/or misleading statements throughout the class period and/or failed to disclose that: (1) MTS and its subsidiary were involved in a scheme to pay $420 million in bribes in Uzbekistan; (2) consequently, MTS knew or should have known it would be forced to pay substantial fines to the U.S. government after disclosing in 2014 that the U.S. Department of Justice and Securities and Exchange Commission were investigating its Uzbekistan operations; (3) MTS’ level of cooperation with the U.S. government and remediation was lacking; (4) due to the aforementioned misconduct, MTS would be forced to pay approximately $850 million in criminal penalties to the U.S. government; and (5) as a result, defendants’ public statements were materially false and/or misleading at all relevant times. SAN DIEGO, CA / ACCESSWIRE / April 19, 2019 / Beacon Management Services helps their clients gain a better understanding of their consumer rights. They provide their clients with support, empowerment through knowledge, and open communication. They provide their clients with document preparation services, credit monitoring, and financial rehabilitation services. With the Beacon team on your side, you can regain financial control through a better understanding of your consumer rights, document preparation services, and credit monitoring. Finances are a headache for most people. With more Americans carrying heavier debt loads than ever before, there is a definite need for companies that specialize in financial assistance. Beacon Management Services helps their clients regain financial control through a more comprehensive understanding of credit and finances. With the guidance of a Beacon team member, you can help build a solid economic foundation upon which to grow and help reach your financial goals for the future. Through the services of document preparation, credit monitoring, and financial rehabilitation, the Beacon team provides premium service to each and every client. When it comes to managing and monitoring your finances, paperwork is a tiresome aspect that most people struggle with. Part of the Beacon Management services is to cover document preparation. They take care of storing important information for you, making sure any pertinent paperwork is filled out correctly and filed on time. One of their most popular services, document preparation removes a lot of stress for their clients by ensuring that any and all paperwork is stored, filled out, and filed on time. Clients don’t have to worry about missing deadlines and keeping up with the constant demands of paperwork; the Beacon team takes over that aspect of financial management. Credit scores are an extremely important part of people’s finances, especially if they plan on borrowing money to reach some of life’s big benchmarks such as purchasing a home, buying a car, or taking out a student loan. Many people don’t really understand the concept of credit or how credit reports work and affect their financial health. Beacon provides their clients with a 24/7 credit monitoring platform that keeps them informed of changes to their reports so they can monitor the activities that are affecting their score. In this digital age, identity theft is a growing concern. With the Beacon credit monitoring alert program, clients can easily watch their credit reports for suspicious activity and warning signs. If a healthy credit score to help you achieve your financial goals is something you are interested in, the Beacon credit monitoring platform can easily help you achieve this. Beacon financial specialists work closely with their clients to help develop a strong foundation for economic growth and stability. They assist their clients in taking the necessary steps to help them reach their future financial goals. Advisors focus on educating their clients so they can make better-informed decisions and offer a customized approach to helping empower each and every client. The Beacon advisors assess each client’s financial health and help create a strategy for moving forward, establishing healthy financial habits, and laying the foundation for reaching future financial goals. The Beacon Management Services team provides the valuable service of helping their clients reach their financial goals and has helped set the industry standard. Each and every Beacon advisor works with their clients to come up with a customized financial strategy. They provide a number of valuable services such as document preparation, credit monitoring, and financial rehabilitation. If you are one of the many people struggling to get control of their finances and credit score, Beacon Management Services can help you achieve your financial goals. Allegations: Conagra Brands, Inc. made materially false and/or misleading statements and/or failed to disclose that: (i) Conagra inadequately performed proper due diligence in connection with the acquisition of Pinnacle; (ii) the performance of Pinnacle’s three leading brands was not deteriorating due to intensified competition, but to self-inflicted subpar innovation and executional missteps; (iii) Pinnacle’s business was performing so poorly that it had resorted to pushing promotional deals to retailers in an effort to boost sales; and (iv) as a result of the foregoing, Defendant’s public statements were materially false and/or misleading and/or lacked a reasonable basis when made. Allegations: CVS Health Corporation made materially false and/or misleading statements throughout the class period and/or failed to disclose that: (i) CVS Health’s financial condition and expected earnings were deteriorating as a result of rising costs and poor results associated with the Omnicare Acquisition; and (ii) as a result, CVS Health’s public statements were materially false and misleading at all relevant times. Allegations: During the class period, Apple Inc. made materially false and/or misleading statements and/or failed to disclose that: (a) the U.S.-China trade war had negatively impacted demand for iPhones and Apple’s pricing power in greater China, one of Apple’s most important growth markets; (b) the rate at which Apple customers were replacing their batteries in older iPhones rather than purchasing new iPhones was negatively impacting Apple’s iPhone sales growth; (c) as a result of slowing demand, Apple had slashed production orders from suppliers for the new 2018 iPhone models and cut prices to reduce inventory; (d) unit sales for iPhone and other hardware was relevant to investors and the Company’s financial performance, and the decision to withhold such unit sales was designed to and would mask declines in unit sales of the Company’s flagship product; and (e) as a result of the foregoing, defendants lacked a reasonable basis in fact when issuing the Company’s revenue outlook for the first quarter 2019 and/or making the related statements concerning demand for its products, as Apple’s business metrics and financial prospects were not as strong as defendants had led the market to believe. To learn more about the Apple Inc. class action contact jlevi@levikorsinsky.com. NORWALK, CT / ACCESSWIRE / April 19, 2019 / Omega Engineering is inviting customers to explore its new website. Designed to offer B2B customers a consumer-oriented experience, the site has been completely overhauled. Customers will discover not only cutting-edge functionality but improvements that make it easier and more seamless to order products, search for content or manage their account. 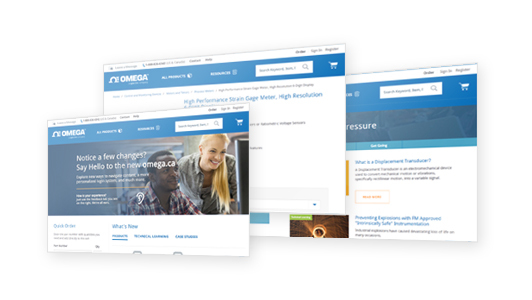 ”With this new website, we are able to serve our customers in the way they want to be served,” says Greg Wright, president of Omega. This includes providing an exceptional experience on and off the website. ”Whether a customer uses the phone, mobile or our website, they’ll find new systems on our side that make it easy for them to interact with us and get their problems solved with minimal effort,” says Wright. In addition to displaying an inventory of over 150,000 items that can be searched by product type, category, dimension, size and other attributes, part of the new website launch also includes revamping other digital properties, such as an integrating a new CRM, a new order-tracking system and more secure and organized data management. Improvements in order placement have also been added to the site, such as improved processes for customer updates on order status and shipping. For more information on Omega Engineering, please visit www.omega.com. NEW YORK, NY / ACCESSWIRE / April 19, 2019 / The Klein Law Firm announces that class action complaints have been filed on behalf of shareholders of the following companies. If you suffered a loss you have until the lead plaintiff deadline to request that the court appoint you as lead plaintiff. The lawsuit alleges that Stamps.com Inc. made materially false and/or misleading statements and/or failed to disclose that: (i) the Company’s financial results depended on the manipulation of a USPS program that cost USPS an estimated $235 million per year; and (ii) as a result, the Company’s business was unsustainable and its financial results were highly misleading. The complaint alleges that throughout the class period Syneos Health, Inc. made materially false and/or misleading statements and/or failed to disclose that: (1) Syneos Health’s internal control over financial reporting was inadequate; (2) concerns regarding Syneos Health’s internal control over financial reporting would result in heightened regulatory scrutiny and an SEC investigation into the company’s revenue accounting policies, internal controls and related matters; and (3) as a result, defendants’ statements about Syneos Health’s business, operations, and prospects were materially false and/or misleading and/or lacked a reasonable basis at all relevant times. CenturyLink, Inc. allegedly made materially false and/or misleading statements and/or failed to disclose that: (1) CenturyLink had undisclosed material weaknesses in its internal controls over revenue recording processes and the procedures for measuring fair value of assets and liabilities assumed in connection with its Level 3 Communications, Inc. acquisition; (2) consequently, CenturyLink would delay the filing of its Form 10-K for the fiscal year ended December 31, 2018 despite initially reporting those financial results in a press release dated February 13, 2019; and (3) as a result, CenturyLink’s public statements were materially false and misleading at all relevant times. Washington, D.C.–(Newsfile Corp. – April 19, 2019) – The Securities and Exchange Commission today announced that Prosper Funding LLC will pay a $3 million penalty for miscalculating and materially overstating annualized net returns to retail and other investors. San Francisco-based Prosper is a marketplace lender that, through its website, offers and sells securities linked to the performance of its consumer credit loans. According to the SEC’s order, from approximately July 2015 until May 2017, Prosper excluded certain non-performing charged off loans from its calculation of annualized net returns that it reported to investors. The order finds that, as a result, Prosper reported overstated annualized net returns to more than 30,000 investors on individual account pages on Prosper’s website and in emails soliciting additional investments from investors. Many investors decided to make additional investments based on the overstated annualized net returns. The order also finds that Prosper failed to identify and correct the error despite Prosper’s knowledge that it no longer understood how annualized net returns were calculated and despite investor complaints about the calculation. Without admitting or denying the findings, Prosper consented to the entry of an SEC order finding that it violated the antifraud provision contained in Section 17(a)(2) of the Securities Act of 1933. In addition to the penalty, the SEC’s order requires Prosper to cease and desist from future violations of Section 17(a) of the Securities Act. The SEC’s investigation was conducted by Jason Casey and Daniel Nigro of the Complex Financial Instruments Unit. Laura Metcalfe supervised the investigation. NEW YORK, NY / ACCESSWIRE / April 19, 2019 / Antonio Vendome, more commonly known as ‘Nino’, exemplifies the American dream. At the age of 10, Nino was a shoe-shine boy, but he has risen to create a real estate empire and an impressive architectural legacy to leave behind. Through hard work, ingenuity, and drive, he has become a renowned New York real estate mogul. Nino’s daughter, Raquel Vendome, was pursuing training in early childhood education when she decided instead to follow in her father’s footsteps and work for Vendome Property Management, managing properties throughout downtown Manhattan and Queens. Nino’s creative spirit could see the artistic merit in architecture, a spirit he has breathed into other Vendome projects such as the Urban Glass House, Habitable Sculpture, and two SoHo art galleries. With Raquel by his side, there is no stopping this deadly real estate duo. The Urban Glasshouse is a unique and impressive looking 26-story condominium building featuring bike storage, a state-of-the-art gym, and impressive and modern condominium units. Inspired by his collaboration with infamous architect, Philip Johnson, Vendome completed the Urban Glass House. Located in the heart of the Hudson Square neighbourhood. The name ‘Urban Glass House’ refers to Johnson’s earlier Glass House in New Canaan, Connecticut. After Johnson’s passing, Vendome continued to honour his creative spirit with The Habitable Sculpture. Vendome has a long list of impressive projects, including his two SoHo art galleries: Studio Vendome Projects and Studio Vendome. Antonio and Raquel Vendome believe in giving back to their community. After 9/11, they exemplified the spirit of philanthropy by opening up Vendome’s Canal Street restaurant, ‘Nino’s American Restaurant’, to first responders and anyone helping with the tragic aftermath of the attack. Offering them free meals and a place of solace during a difficult time, the Vendomes exemplified how the efforts of a few can make a big difference to many. Using their prominent role in New York’s real estate industry, Antonio and Raquel continue to develop and manage impressive real estate projects that enhance the New York City skyline. The Studio Vendome hosted Lin Evola’s inaugural art exhibit for The Peach Angels Project entitled ‘World on Fire’. Displayed outside of Nino’s Canal Street restaurant, Evola’s renaissance angel sculpture serves to symbolize the reverence that Nino’s restaurant holds for the locals and first responders to 9/11 who used the restaurant as a staging area for rescue efforts. While Raquel was born into a family of affluence, she still had to work hard and struggled to determine which path her life should take. Although she was pursuing a career in early childhood education, there was a calling she could not ignore: the calling to carry on her father’s legacy and work in the family business. Apprenticing under her father, Raquel began to pursue her impressive real estate career. From planning property acquisitions to working on establishing lucrative and long-term business partnerships, Raquel started to master the industry and all of its networking and entrepreneurial challenges. Raquel had observed the hard work of her father as a young girl and found it inspirational. Although it wasn’t an easy decision to follow in her father’s footsteps, it was one she felt destined to fulfill. Joining Vendome Developments is a role Raquel takes very seriously, and it is Nino’s values and work ethic that she strives to emulate in each and every project and business relationship. Every now and again, an unparalleled example of the entrepreneurial spirit emerges to inspire us all. From humble beginnings, Antonio Vendome rose to build a real estate empire and a lasting legacy to pass down through his daughter, Raquel Vendome. Together, they are redrawing the infamous New York City skyline one architectural project at a time.